New digital tool helps schools engage K-5 students in self-discovery and interest exploration to encourage college and career aspirations. In Texas, the Manor Independent School District is working to help each student graduate with two pieces of paper – a high school diploma and an industry certificate. Watch this webinar and hear the experiences and real stories of counselors and principals who have implemented Naviance Curriculum in the 2014-15 school year. Are students who apply to dozens of colleges the norm, or do they make news because they are not? The Naviance Class of 2015, representing more than a quarter of U.S. graduating seniors, tells a different story. ​With the introduction of the Common Core State Standards and other college and career readiness initiatives in recent years, states are trying to determine how to best support all students as they develop the skills to complete high school and plan for their futures, whether that means entering college or the workforce. BASIS Chandler and BASIS Scottsdale, open-enrollment charter schools located just outside of Phoenix, neared the end of the 2012-13 school year facing significant challenges. With no central location to track college application data, transcripts sent, letters of recommendation, and test scores, the staff was ill-prepared to ensure college application materials were tracked and submitted on time. BASIS knew they needed a solution. Brooke, a recent high school graduate, describes her experience in using Naviance's career exploration tools and assessments to find her ideal career path. Roadtrip Nation, a career exploration organization based in Southern California, will work with Hobsons’ Naviance, a national career and college readiness platform, to launch a robust college and career exploration curriculum for students in grades 6-12. The partnership was formed as part of the organizations’ Clinton Global Initiative (CGI) Commitment to Action around CGI America. CGI America is a branch of the Clinton Foundation that finds solutions to promote economic recovery in the United States. The Naviance College and Career Readiness Curriculum was created to help students achieve their aspirations. 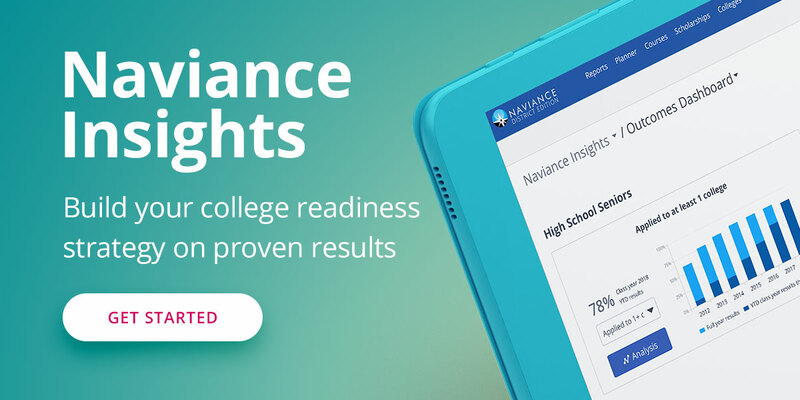 This report outlines the mission and development of the Naviance Curriculum, plus describes the outcomes for students who took Curriculum lessons. Where is College & Career Guidance Heading Next?